With school starting, I’ll make a batch or 4 of these at night and then freeze them, then pop a waffle piece in the toaster in the morning. Voila, whole wheat breakfast that’s fresh and easy! 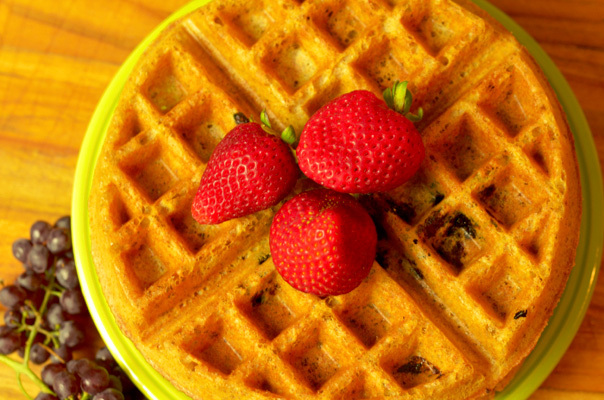 Normally whole wheat waffles are soggy and dense, but the inclusion of cornstarch gives the waffle a great crunch, and the apple cider vinegar makes them light and airy – you won’t believe it’s whole wheat! Add milk, egg, oil and vanilla, and mix well to combine. Add enough liquid so that batter makes a small mound/ribbon temporarily before returning to level. If you’re adding in additional fruit (blueberries/bananas/apples), do it now, and gently stir. Right before pouring batter on the waffle iron add the vinegar, mix quickly. Make waffles as per the instructions for your specific waffle maker. Place on a cooling rack immediately after removing from the waffle iron. If you plan to freeze and reheat, wrap individually, and reheat in your toaster on a medium setting. For blueberry waffles add 1/2 cup fresh or frozen (and thawed) blueberries. For the strongest blueberry flavor, try to find smaller berries. For banana, add one mashed banana and mix in immediately prior to adding the vinegar. With tailgating just around the corner, this take on a football classic. It includes all the great flavor, but with a healthier calorie count! 1/2 of a red/purple onion, diced. Wash potatoes and put in a large stockpot. Cover with water and bring to a boil. Cook until a knife or fork easily pierces the potato (approx 30 minutes). Strain and put in the fridge until potatoes are cool. Meanwhile, combine olive oil, lemon zest and olive oil in a frypan over medium low heat. Cook until onion is translucent (5-10 minutes). Let cool. 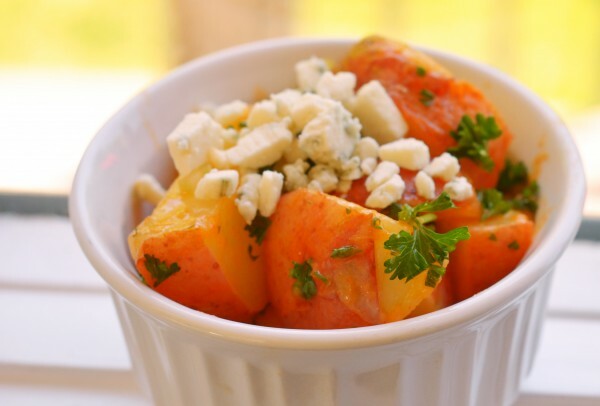 Once potatoes are cool, slice into bite sized pieces, and add to a large mixing bowl. Add onions/oil/lemon mixture, celery, Buffalo wing sauce, parsley, 1/2 of the blue cheese, and salt. Mix well. Before serving, sprinkle blue cheese crumbles on top as a garnish. Preheat a large frying pan over high heat, add add olive oil to a depth of 1/8″. Liberally salt one side of the pork chop, add to the pan salt side down. Generously salt the other side. Cook for 3-4 minutes per side, until the pork starts to brown and form a crust. Transfer the pork chops to an oven safe cooking vessel. Insert an oven safe temperature probe into the thickest part of the pork chop, and set your oven alarm to 140° F. (Carryover cooking will bring the pork to at least 145°). I prefer the Chef Alarm, from Thermoworks. While the pork is in the oven, add the apples and onions to the same pan that your pork chops were in. Cook for 2-3 minutes, until onions start to turn translucent. Reduce heat in pan to medium-low. Add chicken stock, apple juice and thyme. Cook until liquid has reduced by 3/4ths. Add cream and nutmeg to the onion/apple mixture and mix until combined. Bring sauce to a boil and cook until sauce has reduced by 1/2. Add salt to taste. After the pork chops have reached their internal temperature, pull them out of the oven, cover with foil, and let rest for at least 5 minutes. 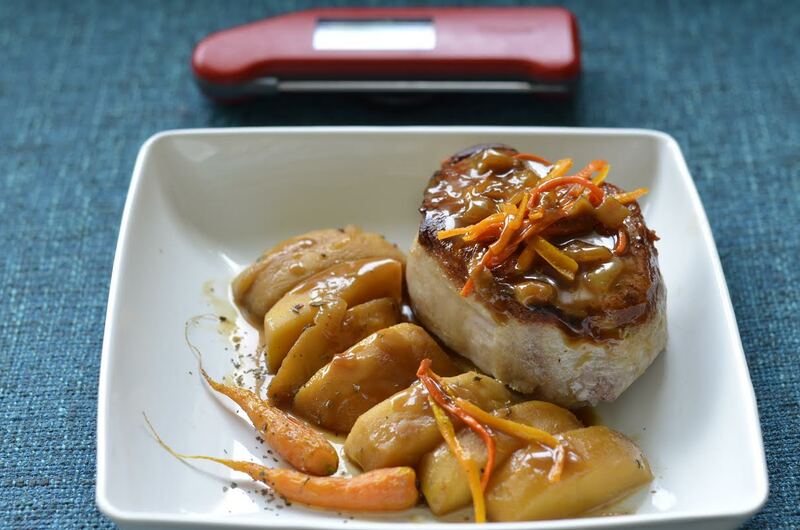 Serve the pork chop topped with the roasted apple cream sauce. 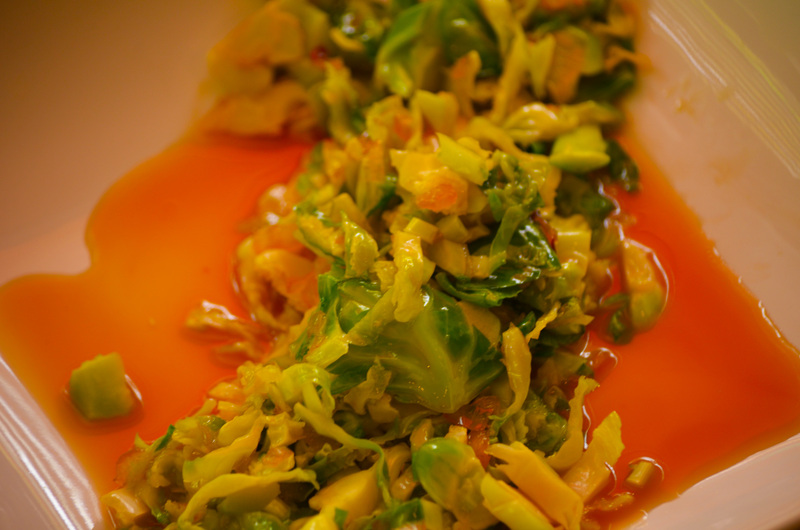 Combine the vegetable oil, 2 Tbs of red wine vinegar, 2 Tbs of table salt and yellow mustard in a medium size bowl. Whisk to combine. 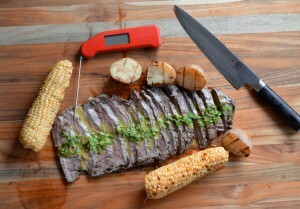 In a 1 gallon resealable plastic bag (like a ziploc), place the flank steak, and pour in the marinade and seal the bag. Place in a refrigerator safe container, and store in the fridge for at least 2 hours. While grill is preheating, combine parsley, olive oil, oregano, 2 Tbs red wine vinegar, lemon juice, salt and garlic in a blender or food processor. Mix until combined. Remove flank steak from the marinade, and place on grill. Flip the steak at least once, and cook to an internal temperature of 130° F. Remove from grill and cover with foil. Let it rest 5-10 minutes before serving. Cut the steak across the grain in 1/8-1/4 widths. Serve with chimichurri sauce. I’m writing to share an opportunity to change a life. As you may know, I’m heavily involved with Operation Smile, an organization committed to changing children’s lives. For as little as $240, a child with a cleft lip can get a life changing surgery. A surgery that builds confidence, removes social stigmas, and literally saves the recipients life. In 1 in 5 cases, an individual born with a cleft will die before the age of 2, unless they receive this simple, yet powerful surgery. On Saturday, March 14th, please join me for the 4th Annual Celebrity Ski & Smile Challenge at Park City Mountain Resort benefiting Operation Smile, an incredible children’s charity that provides life-changing cleft lip surgery for children—essentially, a new smile for life and hope for a brighter future. In three short years, our community has raised enough money to provide life-changing surgery for over 3,600 children around the world through this event. For a great recap of last year, please visit https://www.youtube.com/watch?v=mkNGsBdn9qI. Tickets for our VIP dinner at Red Pine Lodge on Saturday night cost $250, which will provide one cleft lip surgery for a child in need. If you can’t attend, but would like to make an online donation to this fantastic cause, please visit www.operationsmile.org/parkcity. Thank you for joining us in changing lives one smile at a time, and we hope to see you on March 14th! As you may be aware, my day job is with a thermometer company. It’s an important responsibility, helping restaurants in the northern hemisphere keep their food at a safe temperature. As part of an interview for a Food Safety publication, I was asked a bunch of questions about thermometers. I only consider it fair to share those with you. Bi-Metal Stem/Analog Dial (Good) – uses two dissimilar metals pressed together and molded into a spring. As the temperature of the metals change inside the temperature probe, the spring twists, causing the dial on the thermometer to turn. These devices are the cheapest of all technologies, but also take the longest to register an accurate temperature, usually 15 seconds or greater, and are generally accurate to +/- 2° F. Because of their nature, and the fact that there are moving parts, they require calibration, as the spring may change its orientation in the temperature probe. Although they are used in some restaurants, the time to an accurate temperature, and the frequency with which they go out of calibration makes them less desirable than their digital counterparts. Do you have any advice for how consumers should decide their price point? (type of meat or poultry they typically cook, how often they cook meat or poultry, whether they’re at high-risk for foodborne illness complications, etc. I recommend a thermistor or thermocouple thermometer with a reduced tip probe like the Thermapen, or RT600C. This gives the consumer the most flexibility. A bi-metal stem is too thick to accurately temp the inside of thinner meats, such as hamburgers and chicken cutlets. You’ll generally pay more for a faster response time. Be careful with the term “Instant Read,” as some thermometer manufacturers use that term to describe the frequency with which the display is updated, but not necessarily the speed that the thermometer display reflects an accurate temperature. Are digital or analogue thermometers more accurate than the other? Most low cost digital (>$30) will have accuracy similar to an analog. This accuracy is generally +/-2° F, but in some cases may be up to 0.9°F. Higher end digital thermometers will be much more accurate than an analog. Digital thermometers also tend to be more stable over the long term because there are fewer parts to wear. In fact, some models have no moving parts. How deep does the thermometer have to go to get an accurate reading? The goal is to get the thermometer sensor into the thickest part of the food item being measured. This depends on the thermometer being used. Thermocouple probes usually have the sensor on the very end of the probe. Thermistor sensors are slightly larger, and are usually 1/8th of an inch away from the end of the probe tip. Bi-metal stem thermometers may start near the probe tip, but the coil may stretch up to an inch away from the probe tip. Should you be aiming for the middle of the meat? Let’s say I have a chicken breast that’s about two inches thick – should I pierce it through to the pan or only about an inch deep? When taking a temp of cooked food, the goal is to get the lowest possible temperature reading in the food. That way you can validate that the coldest part of the food is still at a food safe temperature. For chicken breast, I recommend piercing the side of the breast near the thickest part of the meat. Is it important to wash thermometers? Before you re-insert into the same meat and between meals? YES. The probe should be cleansed/sanitized after each reading of food that is considered TCS (TCS = food that needs time and temperature control to prevent the growth of microorganisms and/or toxins). Is there anything else that’s particularly important to remember when cooking? Do all thermometers need to be calibrated? Bi-metal stem/analog thermometers should be calibrated. Digital thermometers should be tested to verify that the temperature reading is accurate. One of the reason thermometers from Thermoworks rarely need recalibration is that they are made from high-quality thermocouple materials and thermistors. These components can remain stable for years when used at cooking temperatures. It should be noted that some digital thermometers do require recalibration. With bi-metal stems, it’s possible that the mechanical works holding the probe and dial arm in place may shift, particularly as the metal housing expands and contracts as it is exposed to temperature variation. With digital thermometers, it’s important to validate that the sensor probe hasn’t been damaged, and therefore still within appropriate specifications. How would a consumer calibrate their thermometer at home? How often do they need to calibrated? Most restaurants validate their thermometers daily, and the FDA recommends they be calibrated “at a frequency to ensure accuracy” (2013 FDA Food Code Guide 3-B, section 36). The recommendation for home users is less specific, it’s good practice to check and verify that the thermometer is within accuracy specs at least once per month, prior to a big cooking event (Thanksgiving, for example), or if the thermometer had been subjected to an over temperature condition or dropped. When should consumers replace their thermometer? If the thermometer cannot be made to read within +/-2° F of the correct temperature, it is time to replace it. THE NEW COOKBOOK IS HERE!!! The new cookbook’s here, the new cookbook’s here, things are going to start happening to me NOW. 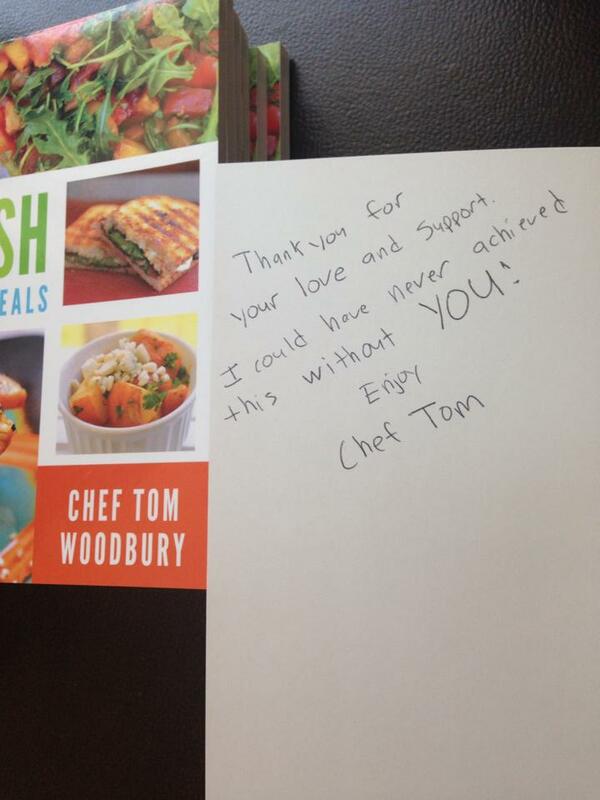 SPRINGVILLE, Utah – 9 July 2014 – TV personality Chef Tom Woodbury of Holladay Utah is pleased to announce the release of “Eat Fresh: Quick and Easy Meals,” which will be in bookstores July 9, 2014. Chef Tom Woodbury’s innovative and creative approach to preparing and cooking meals in his new cookbook “Eat Fresh,” will motivate even the most reluctant cooks to try his recipes. Combining Chef Tom’s love of science and artistic genius, “Eat Fresh” shows you that the tastiest food is also the healthiest food. Ingredients for each meal have been carefully selected and combined to create a symphony of color, texture, and flavor that will inspire and satisfy mind, body, and soul. And moreover, his simple-to-follow instructions can make even the cooking-challenged into gourmet aficionados. Sick of the run-of-the-mill breakfast cereal? Try on Lemon Ricotta Pancakes or Breakfast Cheese Souffle for size. What’s for dinner? How about Tandoori Chicken Tenders or Italian Seafood Soup? Dessert anyone? Grilled Strawberry Shortcake and Orange Meringue Cookies look delicious–and let’s not forget to mention the amazing selections for side dishes, appetizers, soups, and salads. Packed with over 100 meals for every hour of the day and for every appetite, “Eat Fresh,” is for anyone who loves to eat and feel good about it. “Eat Fresh” is available for purchase at Barnes and Noble, Amazon, www.cedarfort.com, Books and Things, and independent book stores. the lumps in the flour have dissolved. and vegetable oil and toss to combine. Add salt and garlic to the beans, and mix well. until beans are approximately half their size and completely dry. Preheat a large frypan over medium high heat. Remove skin from chicken thighs and dredge in flour. Add oil to pan and then add the chicken. Cook each side till brown, turning once (about 4 minutes per side). 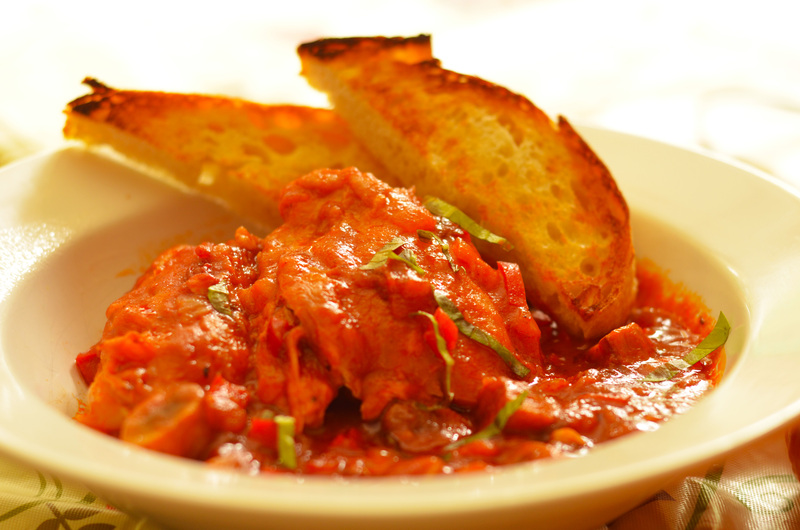 Set chicken in slow cooker. In the same pan, add mushrooms and cook until they start to brown and reduce in size (about 10 minutes). Add onions, and then garlic. Cook until translucent. Add mushroom/onion/garlic mixture to the top of the chicken. Add tomato sauce, chopped bell pepper and oregano. Add enough stock to JUST cover the chicken. Turn slow cooker to highest setting and cook until thighs are tender (1-2 hours). Add salt prior to serving. Serve with crusty bread and garnish with chopped basil. Place cooking vessel on stove on medium-high heat. Add oil. Remove skin from chicken thighs and dredge in flour. Add oil to pan and then add the chicken. Cook each side till brown, turning once (about 4 minutes per side). Set chicken aside. Add mushrooms to the same pan you cooked the chicken. Cook over medium-high heat until they start to brown and reduce in size (about 10 minutes). Add onions, and then garlic. Cook until translucent. Add tomato sauce, chopped bell pepper and oregano to the onion/mushroom/garlic mixture and cook for 5-10 minutes. Add chicken back to the sauce and add enough stock to just cover the chicken. Cover the vessel and cook in a 350 degree oven until chicken is tender, about 1 hour. Salt to taste prior to serving.